Lawn mowing may be a trivial job, but few people can spare the time and efforts required to maintain their lawns. If you are one of them, we suggest you take advantage of the professional lawn mowing services we provide across Battersea and the vicinity. We have teamed up with experienced and skilled gardeners, who can drop by for a one-off mowing session or provide regular lawn maintenance on a biweekly or monthly basis, depending on your needs. Prices are so competitive that anyone, including you, can afford to book the service! We have recruited only experienced, highly-skilled gardeners on our team in order to deliver a quality service that lives up to the established standards of the trade. Our team uses specialised mowers so it matters not how big your lawn is – we can get the job done in no time. Our goal is to work to customers’ individual specifications, which is why we always comply with their requirements. We can lend your lawn a bespoke look by mowing the grass in a pattern of your choice. One important aspect of our service is pest eradication and prevention. 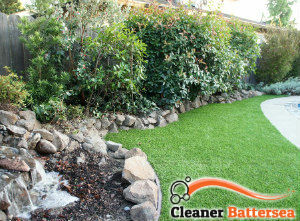 You cannot expect to have a neat and lush lawn if it is plagued by harmful insects. Our gardeners will spray the grass with specialised pesticides that are safe for you and your family. This will keep your lawn green and dense throughout the year. 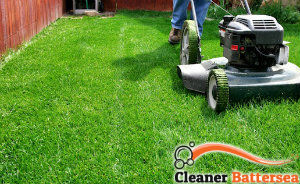 The team will take care of all grass clippings, shed in the mowing process so you don’t have to worry about that. Call us to book our lawn mowing services, available in Battersea, SW11 and the nearby areas – we are at your service seven days a week.